V CHANNELS AND TRANSPORTERS: WHERE IS THE DIFFERENCE? Chapter 7: Functional Properties of Ca2+–Dependent Cl− Channels and Bestrophins: Do They Correlate? V PDZ PROTEINS: WHAT ARE THEY? WHERE ARE THEY? WHAT DO THEY DO? All living cells are surrounded by a lipidic membrane that isolates them from the often harsh environment. However, to take up nutrients, to excrete waste, and to communicate among each other, Nature has invented an incredibly diverse set of transmembrane transport proteins. Specialized transporters exist to shuttle electrically charged ions, positive cations like sodium or negative anions like chloride, across the membrane. In the recent years, tremendous progress has been made in the field of chloride transport. 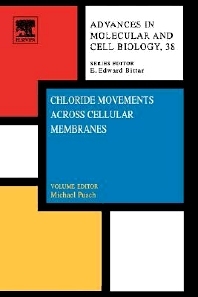 The present book presents the state of the art of this rapidly expanding and interest-gaining field of membrane transport. It is addressed at a broad medically, physiologically, biologically, and biophysically interested readership. Neuroscientists, physiologists, pediatricians, membrane biophysicists, nephrologists, neurologists, structural biologists.